This limited edition timepiece looks to win over lovers of high class jewelry and speed. We have all dreamed once of being able to admire our favorite watch while racing down the highway on a motorcycle. Now, this will be possible thanks to a collaboration between Harley Davidson Mexico and Bomberg. 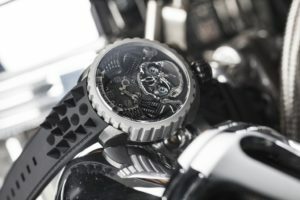 The Skull Rider Collection was an idea conceived by Rick De La Croix, executive president of the Attila Group, a company whose portfolio includes luxury watch brands such as Bomberg, Gucci, and Hublot. In a chat with Forbes Life, Mr. Rick De La Croix explains that ever since he was a boy he admired the policemen who cruised down the Californian highways on their Harley Davidsons, and thus has always been a fan of the American brand. This collaboration now launched in Mexico is based on Bomberg’s Bolt 68 Collection, which was the first make a wrist watch that could become a pocket watch. 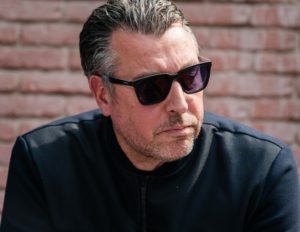 After becoming the first luxury brand to create a collection of convertible watches with the Bolt 68, President of Attila Group Rick De la Croix‘s objective became to create a watch that could go from the wrist or the pocket to the motorcycle, as in this case, to the Harley Davidson. He takes pride in this brand’s decision to form part of the Skull Rider Collection, and feels a sense of personal fulfillment since he admired the brand from a young age for being able to create its own community and culture. 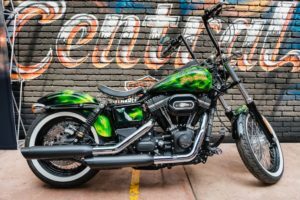 When asked how difficult it was to convince Harley Davidson to become part of the collection, De la Croix said: “When you speak with passion and do what you love, people have an easy time listening”. He added that these Bomberg products are very particular because every piece in the Skull Rider Collection is inspired by motorcycles, from the chains to the pistons. 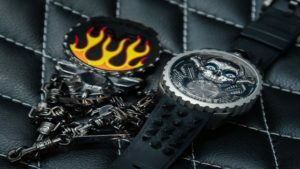 Another point in common between these companies that adds a bonus to the alliance is that many wearers of Bomberg watches in our country are also fans of Harley Davidson. Therefore, having a Bomberg is becoming part of the Harley Davidson cult. 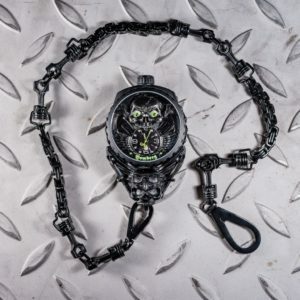 The Skull Rider Collection is comprised of three, 47mm semi automatic watches: black with green details, gold with red details, and gray with blue details. The collection is limited to 250 units and each piece has a price of 70,000 pesos. On the matter, Rick De La Croix mentioned that the first 50 people who purchase this watch in the Iron Palace will be able to participate in a raffle that will take place at the end of February. The winner will receive a one of a kind special edition motorcycle created by the collaboration of these two brands. Rick De La Croix said that Mexico is the number one market in Latin America for the high class jewelry industry. He credited the proximity of our country to the United States as to why Mexican clients strive for sophistication and education, and added that Mexican clients always want to be up on the last fashion, be recognized, and are not afraid of creating their own personal brand. Bomberg sells 4,000 watches in the country annually, and is thus an excellent market for the brand. De la Croix admitted that it is more difficult to create a brand and enter the market in the United States than in Mexico, where more is spent on the sentimental and attention to detail. “Creating a luxury brand today is different from when I began; If done correctly a consolidated brand can be created much faster now”. Taking advantage of this visit with President de la Croix, we asked him his advice on giving a watch as a gift. He answered that it is important to buy from an authorized distributor that guarantees post sale service, but he considers it more important to understand that a watch is not used to check the time anymore. Therefore the main reason for purchase is the sentimental factor, so one should look for a watch that means something. For example, in his collection of more than 50 timepieces, Rick De la Croix holds special affection for a Bulova that his grandfather gave him because at the time it was a very sentimental gift. Ultimately, all of his watches mean something for him because each is associated with a different moment.